I take hundreds of photos. I don’t think a day passes when I don’t take one or two. This weekend I’ve snapped pictures of my favorite shrimp tacos, my pretty Chipotle salad, Mike’s eyes looking particularly blue, Byrd sleeping with her favorite toy. The other night I was lying in bed thinking about what creates this urge in me and I settled on this: I think we take pictures because we’re afraid of dying. We don’t think of it like that while we’re standing in front of Cinderella’s castle and squishing a little tighter shoulder to shoulder to fit in the frame. We don’t think, “I’m terrified. Let’s take a few more snaps.” It’s more of a current running through our subconscious: I have to capture this moment. I have to stop the clock for a second. I have to preserve this feeling, this memory. I have to hold on to it somehow. I must scroll through a dozen nature photos a week on Instagram even when things aren’t covered with notable amounts of snow. Roses, sunsets, trees, beaches. They’re lovely. I double-tap and keep scrolling. But I’ve been in those gardens before, filled with the heady scent of gardenias under trees leaning with the weight of summer. I’ve seen a rose so perfect, with such an inviting perfume that it’s tempting to take a bite, or at least to kiss the petals. I’ve stood on a balcony overlooking the coast as a storm rolled in through the darkness, my hair whipping around my face and my stomach tight with awe and fear. You can’t double-tap and keep scrolling in those real perfect moments. They seize something in you in a way a picture can’t quite mimic. In that moment overlooking the sea, I did step back inside to get my camera and film the wind because I wanted to remember. And I’m glad I have that little video clip. It does transport me in a way. But I can never truly go back. And if I could — if experiences like that were a dime a dozen — maybe they would stop moving me the way they do. At her funeral I looked down at her sweet tiny fingers, curved with age. They rested, folded, one hand over another. The urge to take a photo immediately surged through me. The urge to keep her fingers with me, to be able to hold them, to see them tapping through flour. But the truth is that my memory had photos already. I have a photo of that very moment, even, with no camera needed. There’s no moral to my thoughts today. I don’t buy that “Stop taking photos and enjoy the moment!” line, since I find it very enjoyable to capture, to document. I spend my life documenting, analyzing, revisiting. It’s who I am. 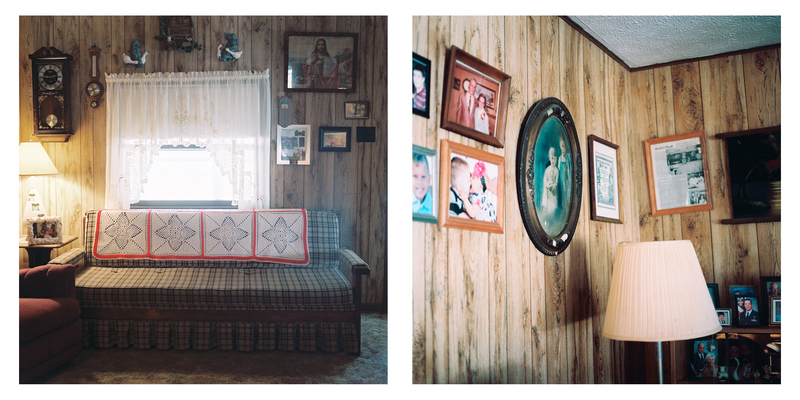 My cousin-in-law, Erin Martinez, went back to my grandmother’s home after her funeral and took the most beautiful, evocative photos of her space. I find myself tearing up looking through them, remembering my childhood visits there. I would never say that photos aren’t valuable, that they aren’t launch points into memory. Erin’s beautiful photos from my grandma’s house. See more of Erin’s work here. I guess all I want to do is lament with you that photos — like words, actually, and memories — can’t do all we want them to do. They can only suggest an experience, not fully embody it. You can’t walk into them like a Lewisian wardrobe and be there all over again. I know that’s not a devastating truth because of what Christ has done for us. Instead, it strikes me as extremely human to find both the melancholy and the sacred in it. 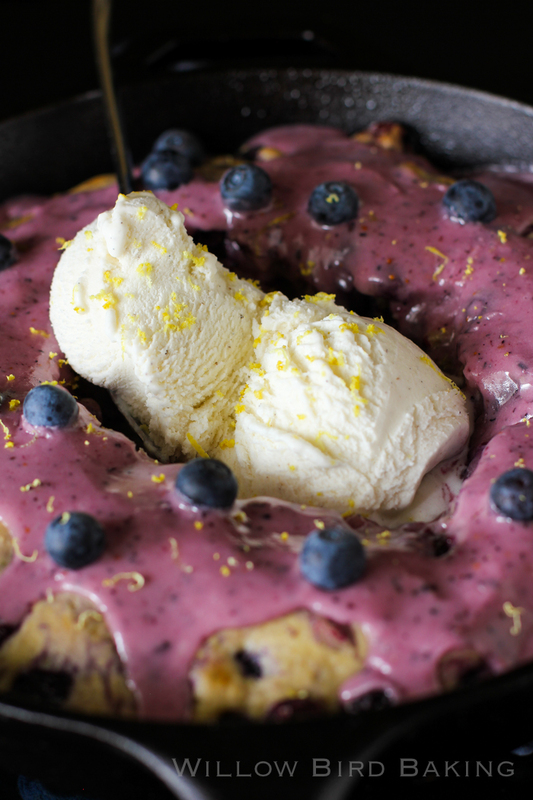 This blueberry cake can stand up to our introspection tonight. I needed something warm, sweet, filling, and comforting to eat with a scoop of vanilla bean ice cream during our recent snow storm and nothing fit the bill like this cake. Throw it together in 10 or 15 minutes and eat it straight from the skillet by the fire — preferably while snapping a memory with someone you love. 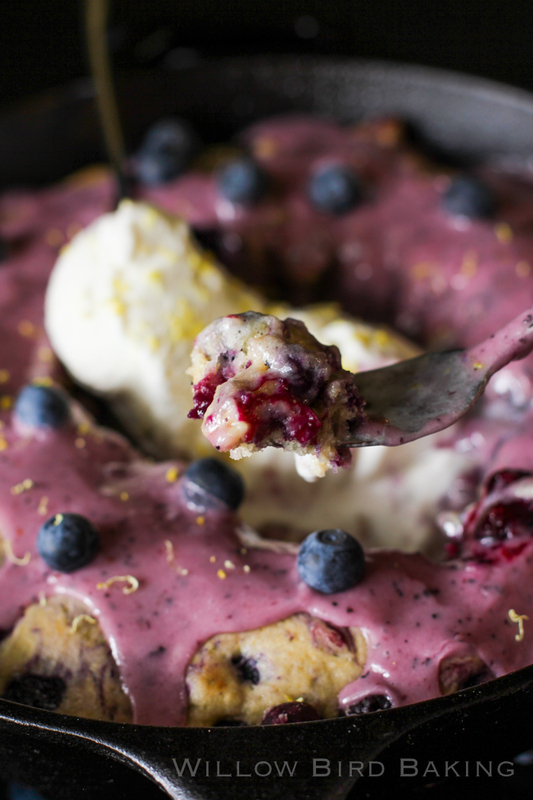 There is nothing like a steaming hunk of blueberry cake topped with vanilla bean ice cream! Go lighter on the glaze than I did for pictures (I always forget how sweet it is and pour too much on) but definitely keep the extra on hand to pour at the table. Preheat the oven to 375 degrees F. In a medium bowl, whisk together the flour, baking powder, salt, and cinnamon. Reserve about 1/4 cup of this mixture in a small bowl. While the cake is still hot, purée the jam and blueberries together in a food processor. Add the extracts. Slowly add the powdered sugar as you process. Add milk slowly to get the desired consistency — I ended up adding about 3 tablespoons. Pour some of your glaze over the hot cake, but go light — I poured too much in the photos above and it made some bites too sweet. 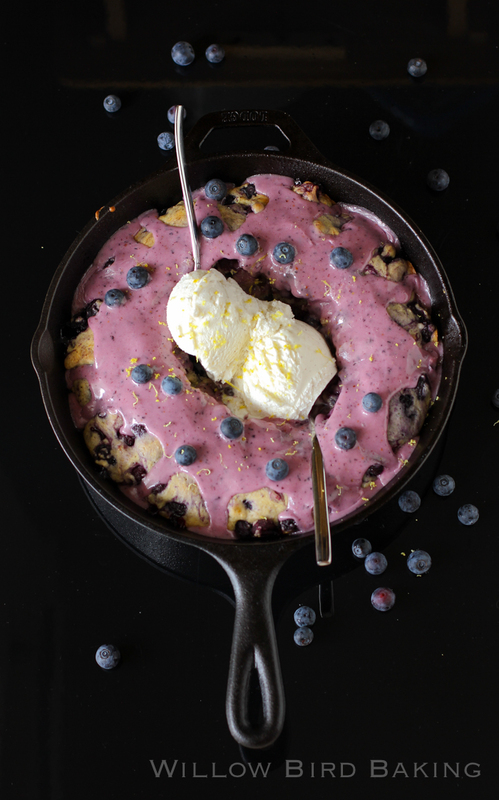 Serve while still warm with fresh blueberries and vanilla bean ice cream (and a little lemon zest if you wish). I love to pause and read through your posts, you always have something interesting, poignant, or funny to say–thank you for that. This cake looks delicious and I appreciate the use of frozen blueberries. I get blueberries when they are grown close by and put them up in my freezer for the rest of the year, so it’s always nice to see a recipe using frozen blueberries when there’s snow on the ground! Oh man, this cake is so pretty!! And I love the glaze! 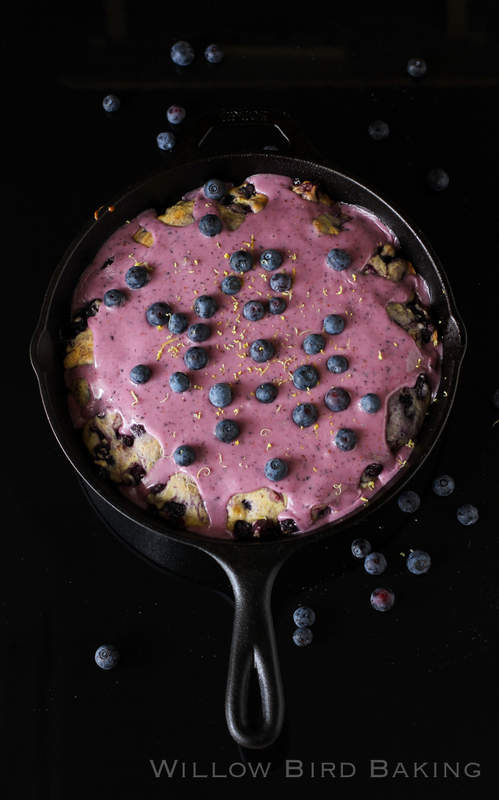 I love blueberries and this cake looks not only tasty but is gorgeous. Pinned to try! Pictures preserve our past; reliving memories that we may not be able to remember. So I don’t buy that saying either to stop and just enjoy the moment! But this cake seems like the perfect treat to slow down with. That glaze with the vanilla ice cream. Perfection! UGH I just want to dive right in the middle and eat my way out of that skillet!!! I am completely addicted to taking pictures – usually of my kids, or pets, and of course food – the pictures of your grandmothers home are just lovely, I wish someone had done that when my grandmother died. Beautiful pictures and beautiful memories. I am the unofficial picture taker in my family – I’ve always got my camera ready to photograph anything and everything. I’m so sorry for the loss of your grandmother. 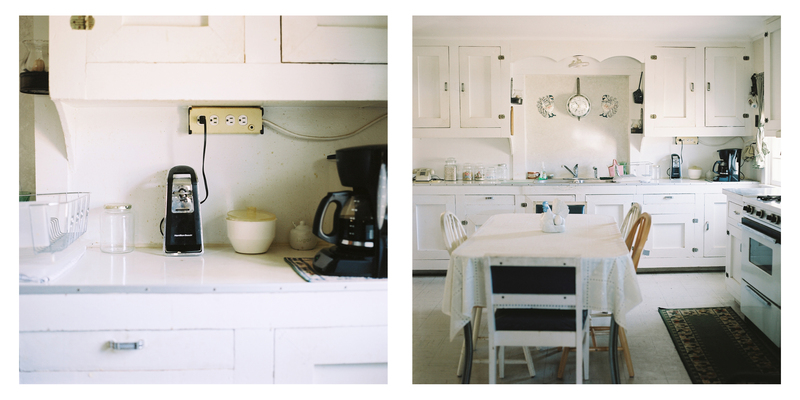 The photos of her home are lovely. This blueberry cake, by the way looks both delicious and comforting. That color!! Beyond gorgeous. Well done! Dear Julie, what you say is true. It is not death itself I think I fear, it is what it will leave behind. All we have are memories, it is what we hold onto so dearly. I fear leaving empty memories behind. That is why I think we do all that we can in this life to preserve those moments…So that years from now, my children and their children can look back and see the world the way we saw it…at this very moment…because life changes so quickly. I lost both my parents at a very young age. All I had left were the few precious memories, the moments, the letters, the pictures, and even the recipes, that carried me through all these years. Now I have the blessing to pass all of that down to my children. I agree, some moments cannot be captured by a single photo, some can only be felt – but like you, I take great joy in capturing as many moments as I can. We are only here for a brief and precious moment. Death is interesting. I’m grateful I didn’t blog about every single moment during my father’s passing 2 years ago, but sometimes I look back and am glad at the times I did. Thank you for the thoughts, and as usual, the beautiful recipe. I know how you feel about memories capturing snapshots of our youth. I still remember all those days holding my grandmother’s hand while walking to school. I felt very sad when she passed away, and kept wishing that I had spent more time with her or took more photos of her when she was alive. But the truth is, our memories are filled with photo albums of picturesque moments. Thanks for sharing this lovely post! So sweetly and beautifully put. Your post brought tears to my eyes. I too am obsessed with taking pictures and I do think you have the perfect explanation. 🙂 Have a beautiful day. Beautiful photos and post – hope this cake warmed you up! Oh man I bet my dad still has a bunch of blueberries frozen in his chest freezer in the basement from when we went blueberry picking crazy over the summer. I’d love to make this! 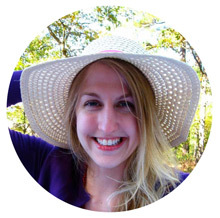 I just love reading your blog and recipes. How do you think this would work with out the Almond extract? Would you add more vanilla or maybe lemon? My husband is allergic to the almond. Hi Bernadette, thank you! Mike’s dad is also allergic to almond extract and so I use imitation almond extract, which it turns out is not made from nuts. That might work well for you. Otherwise, you can certainly leave it out or sub in more vanilla extract. 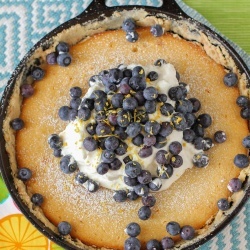 I often see these recipes for baking in a skillet. I do not own one, so is there an alternative pan that I can use in the oven? 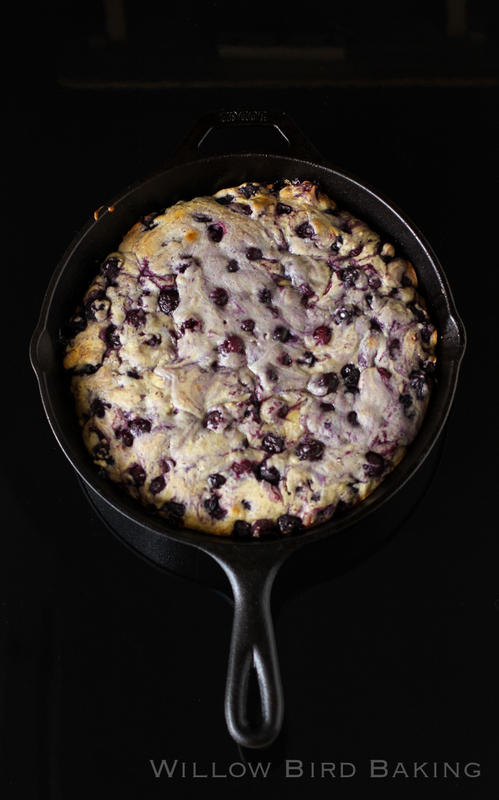 I would totally recommend getting a Lodge cast iron — so convenient, inexpensive, and awesome! But in the meantime, I would try it in an 8-inch square pan. Please let us know how it goes! Hope you enjoy! I am wondering if this cake would work well in a bundt or 9X13 pan…I don’t have a cast iron skillet…thanks. Anna, I wish I knew. This more than anything else is what I realize all my poems are about when I write them. I think the answer is probably something like walking straight into what we fear the most, practicing leaving and losing. Have you read Elizabeth Bishop’s poem, One Art? You might value it. I’ve almost come to think of life as practicing this art / skill / necessity.